On the eleventh anniversary of Abraham Lincoln’s assassination, a monument to the martyred president was dedicated in Lincoln Park, Washington D.C. Fredrick Douglass was the keynote speaker. President Grant was given the honor of unveiling the bronze. Among the spectators was an ex-slave from Lynchburg named Charlotte Scott. Her presence held a special significance. After Lincoln’s, hers was the only other name on the plaque at the base of the statue. by Brandi Marchant and Douglas Harvey. A department store with a nearly seventy-year history in Lynchburg, Millner’s evokes bygone days for many longtime residents—memories of a bustling downtown, paychecks earned, the joys of youth, personable sales clerks, and elegant and stylish merchandise. 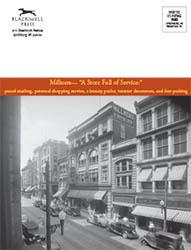 Founded as a dry goods store in 1890, Millner’s came to be recognized as a premier Lynchburg department store and remained locally owned and operated until it merged with Richmond’s Miller & Rhoads in 1957. For almost six decades of the twentieth century the Lynchburg Foundry Company published a most unlikely magazine. Begun as a humble “house organ,” the Iron Worker evolved into a richly produced, widely respected journal of local and state history. The transformation was driven by one woman with a passion for preserving the region’s heritage and with the family connections to make it happen: Lucille McWane Watson (1893–1988). The untold experiences of enslaved people and free blacks during the Civil War are now being addressed in current sesquicentennial exhibits, including an installation at Lynchburg’s Legacy Museum named “Trouble Don’t Las’ Always”: African American Life in Central Virginia During and After the Civil War, 1860–1870. 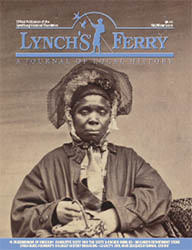 Selections from the exhibit included in this issue have been condensed and edited for Lynch’s Ferry readers.